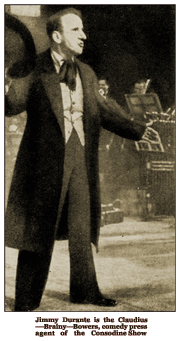 John Hay Whitney was the 'angel' that bankrolled Billy Rose's musical circus, Jumbo, to the tune of $225,000 in 1934. After five postponements and 233 performances at The Hippodrome, Billy Rose's circus extraganza ultimately lost $150,000. 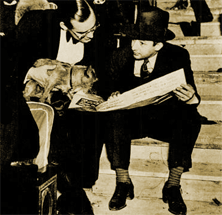 Whitney is seen on the left holding the dog, 'Broadway' Billy Rose on the right, sitting on the steps. 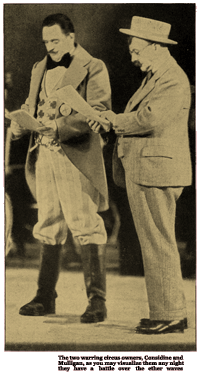 Caption: The two warring owners, Considine and Mulligan, as you may visualize them any night they have a battle over the ether waves. Texaco was an oil company first and foremost. 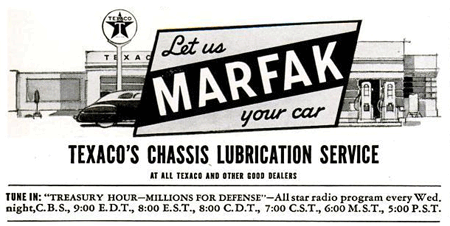 From the very beginning of its sponsorship of Radio programming, Texaco pitched its entire line of petroleum based products and services. Its primary pitch from the earliest days was its production of gasoline derivatives set apart by meeting standards set by the United States Government for emergency vehicles and aircraft. Its Fire-Chief brand of gasoline, as well as its Sky-Chief, higher-octane gasoline were both based on the emergency vehicles and standards concept. Texaco touted the fact that an alleged 'majority' of Fire Departments across the nation employed Texaco's Fire-Chief gasoline almost exclusively, due to Texaco meeting and exceeding the aforementioned government standards. A Fire Chief's helmet and fire trucks were prominently featured in most of Texaco's print advertising of the era. 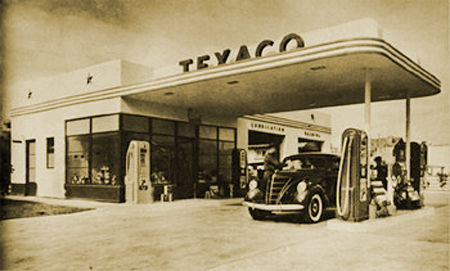 Teague's 1937 design was a model of innovation and utility that soon became mimicked by competing service stations throughout the world. Featuring rounded building corners, porcelain covered tile panels for the walls, up to four service bays for mechanical services, Marfak lubrication, tire repairs, and washing, the stations were a model of utility, space-optimization and streamlined design. Teague's design was also the first to incorporate both men's and women's restrooms into the design, along with large plate glass windows overlooking the gas pump area and encasing an office for the service manager or owner. The large plate glass window afforded an opportunity to prominently display--and promote--tires, batteries and accessories [T.B.A.]. A reporter's-eye view of the goings on backstage at the New York Hippodrome, where Billy Rose's long- heralded production of "Jumbo" is now rehearsing, will be given by Edwin C. Hill, noted radio commentator, during the Fire Chief program to be broadcast this evening at 6:30 over an NBC Nationwide network, including KPO. On the same program, which features Eddy Duchin and his Fire Chief orchestra, the final winners in the Nation-wide "Radio Open" music contest will be introduced to the listening audience. Hill's description of the "Jumbo" rehearsals, antedating the opening night performance of the stage extravaganza by four days, will give the radio audience a graphic preview of the new Jumbo Fire Chief Show radio series which is lo be inaugurated in the Fire Chief program of October 29.
actors, and several elephants and other animals. 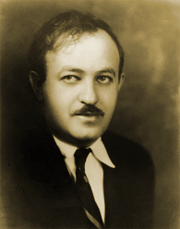 Ben Hecht and Charles McArthur, authors of "Jumbo," will write new radio script for each week's program. Miss Nyla Taylor of Lansdale, Pa., who began her radio career with station KYW, Philadelphia, was named as winner in the Women's division of the Fire Chief Open Contest. Texaco's solution to extending the franchise combined an ongoing, widely publicized 'Broadway' extravaganza with Texaco's Fire-Chief branding to become The Jumbo Fire-Chief Program. 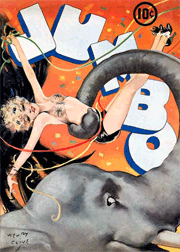 The 1935 Billy Rose spectacular, Jumbo, had acquired as its venue New York's famous Hippodrome to house its combination musical comedy and live circus. Great hooplah and lavish rehearsal teasers to the press became an almost daily news item leading up to Jumbo's premiere on November 16, 1935. By far the era's most extravagant Broadway production, it was nonetheless mounted during an era of great theatrical bloodletting in the wake of The Great Depression. Employing John Considine's Wonder Show as its setting, the production featured, among numerous equally amazing features, a full-sized circus elephant. 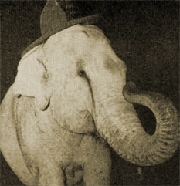 Jimmy Durante emerged as the star of the multi-faceted production, portraying Claudius B. Bowers, the proud--and highly protective--keeper of Jumbo the Elephant--and namesake of the production. 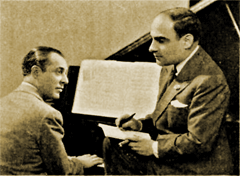 The production's music and lyrics were penned by no less than Rodgers & Hart from a book by no less than Charles MacArthur (Helen Hayes' hubby) and Ben Hecht. 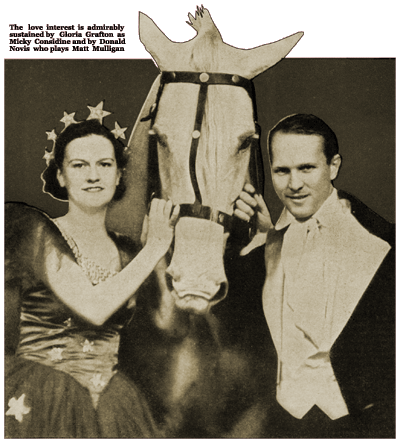 The music was provided by no less than Paul Whiteman and his Orchestra, carried its own glee club--Charles Henderson's thirty-two Razorbacks, featured acrobats, a full complement of clowns, a 35-foot tall puppet, animal acts and in the final scene of each performance featured Jimmy Durante allowing the 8,000 lb. Jumbo to place its foot over Durante's head. 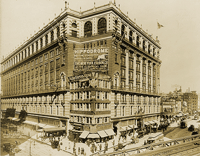 Indeed, the only venue then available in New York to house such a production was The Hippodrome, a 5,000 seat theatre with a 60 foot high ceiling. Could such a monumental production ever fail? Well in fact it could--and did. Jumbo folded after 233 performances, running from November 15, 1935 through April 18, 1936. 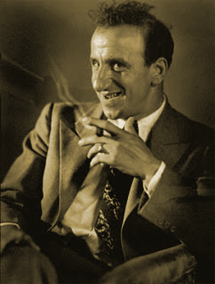 In spite of its relatively short run, the production put Jimmy Durante's career into overdrive, further established Billy Rose as one of Broadway's greatest, most ambitious innovators, launched Charles Henderson's Razorbacks, launched Donald Novis's career, revived A.P. Kaye's career, and eventually found its way to a 1962 film of the same name, which garnered an Oscar nomination for Best Score for Rodgers & Hart. 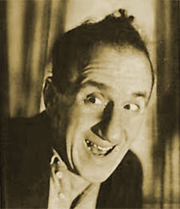 Meanwhile, on the way to its film adaptation, Jumbo was turned into a Texaco-sponsored Radio serial feature starring Jimmy Durante as Claudius B. Bowers. Texaco aired its Jumbo Fire-Chief Program from October 29, 1935--two weeks prior to Billy Rose's Jumbo premiere on November 16, 1935--to January 14, 1936. 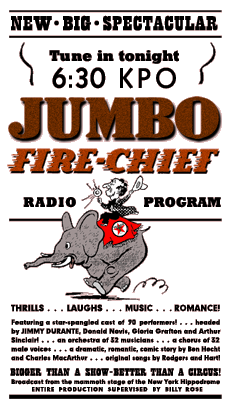 The Radio serial had orginally been intended to coincide with the premiere of the musical, but owing to yet another in a long line of postponements, the Jumbo Fire-Chief Program premiered while the musical was still in the last stages of rehearsals. The Radio version comprised a total of eighteen installments tracing Claudius B. 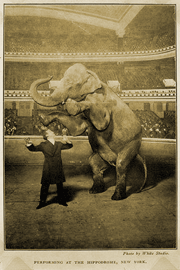 [for 'Brain'] Bowers' efforts to save Jumbo and the fate of The Considine Wonder Show. The Radio serial was an excellent opportunity for both Texaco and Billy Rose. Rose's knack for hyping a production served him well during the run-up to Jumbo's premiere. The opportunity to have a Radio production provide a weekly reminder of the extravagance of the Hippodrome production was a Stage promoter's dream. Broadcasting magazine reported that the radio rights alone to Jumbo cost Texaco $10,000 per episode--in addition to other production costs, orchestra and talent. But for that price, Texaco shut down the Stage production of Jumbo every Tuesday evening--reportedly the first time in Stage History that a dedicated Stage production shut down on a recurring basis for a Radio program during the Stage production's run. The Jumbo Fire-Chief Program serialized the story underlying Charles MacArthur and Ben Hecht's tale of the fate of 'Brain' Bowers and his Jumbo. 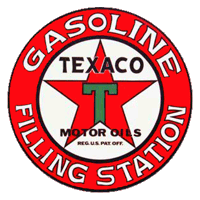 Texaco's production featured Charles Henderson's Razorbacks, singing sensation Donald Novis, and substituted Adolph Deutsch's Orchestra for that of Paul Whiteman. The Texaco production also retained both Gloria Grafton, as Mickey Considine, and A.P. Kaye as Mr. Jellico. In short, the only thing missing from the serialized version of Jumbo over Radio was the popcorn, peanuts, and sawdust--and Paul Whiteman. 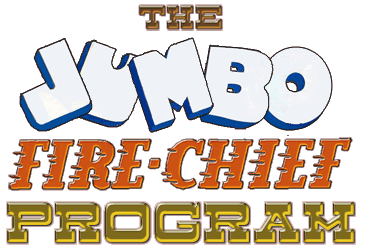 While we'd imagine that the Jumbo Fire-Chief Program would, most optimistically, have been slated for twenty-six episodes, it's apparent that both Billy Rose and Texaco could see the writing in the sawdust for the live Hippodrome production and its consequent effect on the Radio serialization. While a splendid, highly ambitious and critically acclaimed production, it remained afterall, a Great Depression-era production. Rose's 'angel' and benefactor, John Hay Whitney, bankrolled Rose's Jumbo in 1934 to the tune of $225,000--about $3.6M in today's dollars. After five major postponements, a run of only 233 performances, and the draining financial effect of mounting such an ambitious production in post-Depression New York, the production ultimately lost $150,000--or about $2.4M in today's dollars. Though the postponements were an added expense, one can't help but wonder how much the production would have lost had it opened six months earlier, as planned. The postponements were undoubtedly a blessing in disguise, in retrospect. Undaunted, Texaco quickly regrouped, adeptly launching an extension of the Jumbo Fire-Chief Program titled, The Fire-Chief Concert. Broadcasting magazine aricle of October 15th 1935 describes the Jumbo Fire Chief concept and credits. The radioGOLDINdex, Hickerson Guide, Radio Guide Magazine. Two contributors to the Hickerson Guide--initials D.S. and JHa--claim to have a thirteenth episode of The Jumbo Fire-Chief Program, an assertion we find quite intriguing--if not perplexing--since the range of dates they cite for their "thirteen exemplars" spans only twelve weeks. Is there a thirteenth exemplar of The Jumbo Fire-Chief Program? You'd have to ask them. As best as we can determine from our research, Texaco inexplicably abandoned The Jumbo Fire-Chief Program format once it began airing The Fire-Chief Concert. Even more perplexing, Louis Witten teases a following episode of The Jumbo Fire-Chief Program at the close of Episode No. 12, dated January 14, 1936. Wiitten hints at a question of whether Brainy can 'out-point' a U.S. Marshall in the 'next episode.' As best as we can determine, no 'next episode' ever aired. And since The Fire-Chief Concert took the same timeslot, day and network as The Jumbo Fire-Chief Program, it seems unlikely that two programs could have occupied the same timeslot, day, and station/network at the same time. But then what do we know? Just sayin' . . .
We're of the measured opinion that no The Jumbo Fire-Chief Progam episodes aired any further, once Texaco premiered their The Fire-Chief Concert. We may be wrong--we occasionally are wrong. Call us 'from Missouri' on this one, but we're gonna go out on a limb here and state unequivocally that The Jumbo Fire-Chief Program, for all its hooplah and Billy Rose-type splash, ended abruptly with the twelfth episode which aired on January 14, 1936. 9:30-10 P.M.--Premiere: "Jumbo." Musical Sketch. With Jimmy Durante, Comedian, and Others--WEAF. 9:30-10 P.M.--Musical Sketch. "Jumbo," With Jimmy Durante, Comedian, and Others--WEAF. 9:30-10 P.M.--"Jumbo," Musical Sketch, With Jimmy Durante, Comedian; Donald Novis, Tenor, and Others--WEAF. 9:30-10 P.M.--"Jumbo," Music-Sketch; Jimmy Durante--WEAF. Eddy Duchin, one of society's favorite pianists and orchestra leaders is bringing his orchestra to a "bigger and better than ever" Jumbo-Fire Chief show as an added attraction of the weekly program on Tuesdays at 6:30 p.m., P.S.T., over an NBC nation-wide network. 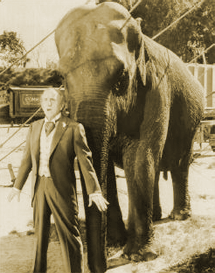 Jimmy Durante with Jumbo in the 1962 film remake of the 1935 Jumbo musical comedy. A 1933 clip of Jimmy Durante promoting the N.R.A. NEW YORK  Jimmy Durante, 86, the raspy-voiced comic who became one of show business' most beloved personalities, died Tuesday at St. John's Hospital in Santa Monica, Calif., where he had been hospitalized for treatment of a form of pneumonia. A true artist, Durante drew upon his own enormous talents, not the files of gag writers, for the uproarious antics and songs that convulsed his millions of admirers over the years. Lesser comedians squeezed laughs with vulgarity, but Durante trusted to his inexhaustible good will and overpowering energy. When the fashion of comedy drifted to insult, he clung to the tradition of the great clowns and gibed only at himself. "There's a million good-lookin' guys," he often said, "but I'm a novelty." Superficial observers, accepting this modesty at face value, sometimes ascribed the Durante fame in theater, nightclubs, movies, radio and television entirely to his comical appearance and raffish mannerisms. But the Durante formula for converting pandemonium into laughter was much more than a preposterous nose, merry eyes, raucous voice, penguin strut and battered hat. Like Charlie Chaplin, W.C. Fields, Willie Howard and Bert Lahr, he had perfect timing and the "feel" of an audience, developed by almost a lifetime in show business. And, like his famous contemporaries, this comedian was indefatigable at the rehearsals that made his brand of humor seem as spontaneous and simple as child's play. So successful was Durante that his trademarks became as well known in the nation as the long nose that brought him the nickname Schnozzola, or Schnozzle. For decades house parties could count on someone to rasp such Durante comments as: "Everybody's gettin' into de act," "Am I mortified," "I'm surrounded by assassins," "Don't raise da bridge, boys, lower da river." A creature of his imagination, Umbriago, became almost as widely known at one time as Pinocchio. Professional comedians tried to capture the Durante technique of word slaughter that brought him laughs with "cazamclysmic," "nonfriction" books. But not even the experts could catch the wondrous frenzy of Durante smashing musical instruments or throwing his hat into the orchestra pit. And when he attacked the piano, honky-tonk style, and roared "I'm Jimmy, the Well Dressed Man," or "Inka Dinka Doo," gangsters and literati alike laughed until they cried. One bookish connoisseur of the Durante studies in frustration said the secret of this waving, stomping, thigh-slapping zany was that "he is eternally baffled by the screwy world, but never angry about it." Offstage, Durante was as popular as during performances. Even in the highly competitive world of professional comedians, where W. C. Fields sniffed at Chaplin as a "ballet dancer," Durante was regarded with enormous affection. One admirer said Durante's only enemy was the King's English. "I know there are more good people than bad ones in the world. I don't mind if a gentleman scratches a match on the furniture so long as he is careful to go with the grain." "Maybe we ain't born equal, but it's a cinch we all die equal." To strangers who crossed his path  fans, doormen, parking-lot attendants, cab and truck drivers and bellhops  Durante was always greeted as Jimmy. He cherished the familiarity. "What's so undignifiable about that?" he would say. "Why, I crinch whenever anyone calls me Mister Durante." His mere appearance made people smile, even when he was not performing. For, as Lou Clayton, the soft-shoe dancer in the Durante troupe from the early 1920's until his death in 1950, used to say, "You can warm your hands on this man." Though his artistry made him very wealthy, his behavior seemed the same as that of the urchin who was born and grew up in the slums of the Lower East Side of Manhattan. His retainers  he was rarely without an entourage for fear of loneliness  were friends of 40 and 50 years. He declined social invitations if these associates were not invited. And he disliked attending big parties, gala movie premieres and the lavish openings of nightclubs, preferring instead to spend his idle time at home chatting with old vaudevillians or horse trainers, or playing the piano. "I got a house wit' two swimmin' pools. One for swimmin' and one for rinsin' off." In later years, he spent his summers at a beach house at Del Mar, Calif., strolling nearby beaches and surf-casting, but seldom swimming. Asked why, he once replied, "When Durante swims, nobody watches." Handicapping thoroughbreds at home was also a favorite, but apparently imprecise, pastime. Whatever his figuring in the race sheets, Durante would bet up to five and six horses in the same race at the Del Mar track. James Francis Durante was born on Feb. 10, 1893. His father, Bartolomeo Durante, a barber, encouraged him to play the piano in the hope he would become a concert artist. But before the boy was out of his teens this hope had been abandoned. By 1910 Durante was banging a honky-tonk piano in Coney Island, where he met Kiddie Cantor, then a singing waiter. For a few years he worked the Coney Island-Bowery-Chinatown circuit of glorified saloons. He went from $1 a night to $25 a week. 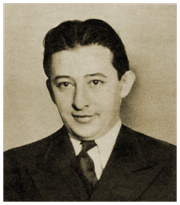 At one of these jobs he met Jeanne Olson, a singer, and married her in 1921. She died in 1943. A year later, while playing at the Copacabana, Durante met Marjorie Little, who was working at the club as a hat-check girl and telephone switchboard operator. After a 16-year courtship, he married her in December 1960, when he was 67 and she was 39. On Christmas Day in 1961 they adopted an infant daughter, Cecelia Alicia. She was nicknamed Ce Ce, and Durante cherished her, his only child. The big break in Durante's career came in 1919, when, with Eddie Jackson and Clayton, he attracted attention from nightclub patrons at the Club Durant, a speakeasy at 232 West 58th Street. In this environment, with the encouragement of Clayton, Durante developed his comic style. Clayton, a shrewd businessman, wangled high priced contracts for the act until it became one of the best draws at the Palace, the pinnacle of vaudeville. Clayton was also reported to have stood off gangsters who tried to kidnap Durante and hold him for ransom. 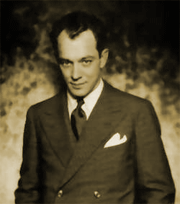 By the mid-30s, Durante had established himself on the Broadway stage with "Show Girl," "The New Yorkers," "Strike Me Pink," "Jumbo" and "Red, Hot and Blue." Brooks Atkinson, drama critic of The New York Times and a Durante admirer, said of the comedian, "In his mountebankery, nothing succeeds like excess." Simultaneously, Durante was lured to Hollywood. At first his movies were disappointing, mainly because of the scripts and the refusal of the movie industry lo let him try the comedy he knew best. In the mid-40s, Durante extended his fame on radio and created a nationwide mystery by signing off programs with a good night to "Mrs. Calabash." Eventually, he confessed in an interview that she was a sweetheart of his in grammar school, the only school he attended. "I like a small place where you know everybody and can kid around." But at the height of his popularity and public affection, he fretted about the durability of his image on television. "That box could be the death of us. They're going to hate us if we stay on too long," he said. Consequently, he ended his regular Saturday night, half-hour television show at the end of the 1956 season. Thereafter, he appeared only once or twice annually on television, as a guest on variety or comedy shows or in spectaculars. He also made one last movie, "Jumbo"  a filmed re-creation of his role in the Rodgers and Hart musical that had charmed Broadway years before. The movie had its premiere as the Christmas-season attraction at Radio City Music Hall in 1962. Playing nightclubs in New York, Las Vegas, Washington and other big cities dominated his work through the 60s. with winks, sighs and shrugs, drew the same roars that had filled Manhattan speakeasies 40 years earlier. Durante limited his nightclub dates to about four months a year, and he scorned suggestions of retiring to a life of wealth and ease. "If y'retire, y'decay," he said in 1965. Four years later, at 76, he still felt the lure of the stage and the audience, noting after one of his periodic appearances, "As long as they laugh, "as long as they want me to sing, I'll stay." But after hospitalizations in late 1972 for exhaustion and a fall, his endurance and health waned. Thin, enfeebled and in a wheelchair, he was a guest of honor in April 1974, at a luncheon show of 1,600 newspaper executives and guests in New York. Several standing ovations greeted him, and he was awarded a statuette. "Thanks a million." Durante responded in a weak whisper. Then  a pause of some seconds. His wife, Marge, leaned toward him. He seemed to draw new strength. He took a table microphone and began belting out his old favorite from years earlier, "Inka Dinka Doo." 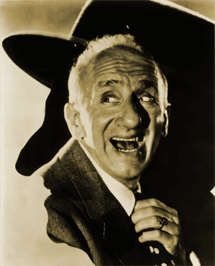 In one of his last interviews before his illness, Jimmy Durante remarked after a Las Vegas performance: "I love it out there. It ain't work. To hear those people out there laugh and enjoy themselves . . . When you're out there, you pray to God that it'll never end." Learning of his old friend's death, comedian George Burns, 84, said: "What can I say that the world doesn't already know? He was a fine man and a wonderful artist." Red Buttons, another old friend, said: "I loved him. We all loved him. I am sorry to hear the news. "But I am almost glad he is out of his misery." After a stroke in November 1972 left him partially paralyzed and confined to a wheelchair, Durante was forced to say good night to Mrs. Calabash for the last time and retire from show business. Throughout his career, one of his trademarks was to end his performances with, "Good night, Mrs. Calabash, wherever you are." He once confided he was referring to his grade school teacher. To Eddie Jackson, who spent more than half a century as partner to the inexhaustible Jimmy Durante, the raspy-voiced comedian was "a fine man." Other celebrities from Bob Hope to Lucille Ball lauded Durante for his artistry and warmth. Speaking haltingly, and sometimes through his wife, the 84-year-old Jackson, who is confined to a wheelchair because three strokes have crippled his legs and left hand and partially paralyzed his throat, praised his years with Durante. "They were together for 57 years beginning in 1917," his wife Jeannie said. "Brothers aren't usually together that long." The deans of American comedy  Burns and Hope  both lauded Durante for his ability to make people laugh. "Will Rogers said he never met a man he didn't like. Well, I never met a man or woman who didn't like Jimmy Durante. Jimmy was a great clown and could liven up a party better than anyone else. He was beautiful man." Milton Berle, who had been a friend of Durante's since the 1920s, said: "I lost a dear friend, and I think the theatrical world has lost a legend." "He was a beautiful human being," said Lucille Ball. "Even that wonderful nose of his was a thing of beauty." "The world lost a great friend when Jimmy Durante breathed his final 'Inka Dinka Doo,'" singer Frank Sinatra said. "He came to my aid when I was just a kid with stars in my eyes, just as he came to the aid of a world looking for laughs and songs and entertainment," Sinatra added. Singer Tony Martin, 67, recalled Durante as "a saintly man," and Cyd Charisse, who worked with him early in her career, said he was "probably one of nicest men in whole world. He was generous and wonderful with everybody."